This still from the video made by NASA's Deep Impact spacecraft shows the moon passing across the face of Earth. NASA?s DeepImpact spacecraft has made a movie of the moon passing in front of the Earthfrom the probe's vantage point millions of miles away. Astronomersplan to use thevideo to develop techniques to look for Earth-like worlds in other solarsystems. "Makinga video of Earth from so far away helps the search for other life-bearingplanets in the universe by giving insights into how a distant, Earth-like alienworld would appear to us," said Michael A'Hearn of the University of Maryland and the principal investigator for the Deep Impact extended mission. DeepImpact, which sent an impactor into comet Tempel 1 on July 4, 2005, iscurrently 31 million miles away from Earth on its way to a flyby of cometHartley 2 on Nov. 4, 2010. During itscruise to Hartley 2, Deep Impactwill be searching for extrasolar planets. Deep Impacttook several images of the Earth during a full planetary rotation; these imageshave been combined into a color video. During the video, the moon enters theframe as it orbits the Earth and then is shown transiting, or passing in frontof, the Earth. 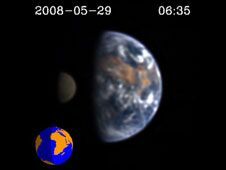 While otherspacecraft, including Voyager 1 and Galileo, have imaged Earth and the moonfrom space, Deep Impact is the first to show a transit of Earth with enoughdetail to see large craters on the moon and oceans and continents on Earth. "Ourvideo shows some specific features that are important for observations ofEarth-like planets orbiting other stars," said Drake Deming of NASA's Goddard Space Flight Center in Greenbelt, Md., and the deputy principal investigator for theextended mission. "A 'sun glint' can be seen in the movie, caused by lightreflected from Earth's oceans, and similar glints to be observed fromextrasolar planets could indicate alien oceans." The team usedinfrared light to look at the Earth because plants reflect more strongly in thenear-infrared, so the video will help scientists evaluate the potential fordetecting vegetated land masses on alien planets. Most of thenearly300 extrasolar planets that have been found to date are Jupiter-sizedbehemoths, though a few "super-Earths," around four to nine times themass of our planet, were recently detected. NASA iscurrently studying planet-characterizing telescopes that would observeextrasolar planets as a single point of light and would distinguish land massesand oceans by changes in the total brightness, said planetary theorist SaraSeager of MIT and a co-investigator on the Deep impact extended mission.